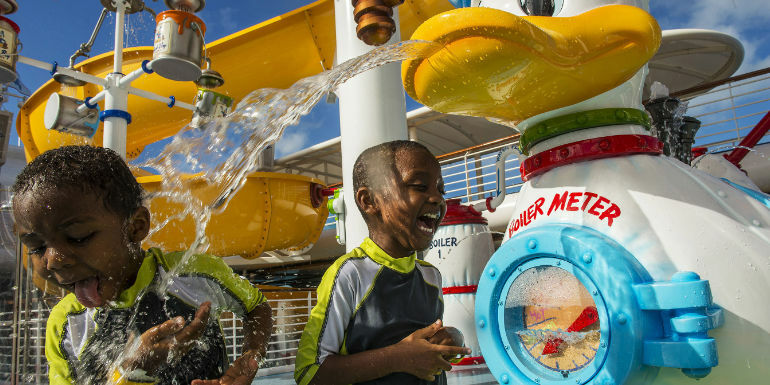 Most new family-focused cruise ships that debut these days include some form of a water park for lots of fun in the hot sun. With water slides and other soaking features in mind, we have compiled some of the best overall water parks at sea. 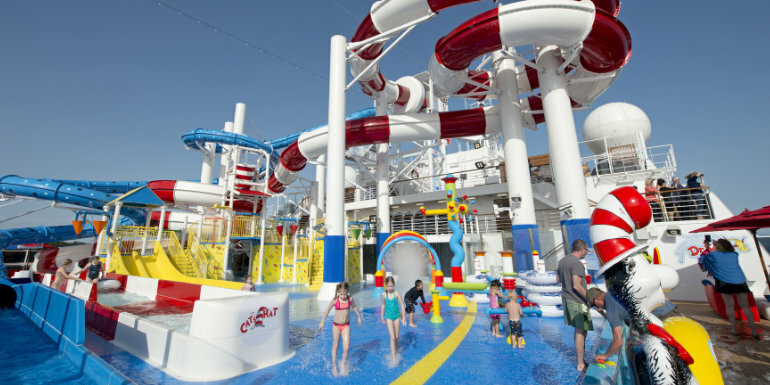 Details: Carnival Horizon’s WaterWorks aqua park is nearly identical to the one on Carnival Vista, but rebranded with Dr. Seuss theming. A blue slide with little round windows gives riders a polka dot effect as they slide down, and a red and white striped slide is reminiscent of the Cat in the Hat’s hat. Details: When Norwegian Escape was introduced to the world, it claimed the largest water park at sea with four multi-story slides and a kids’ aqua park. The tandem tube slide lets riders swirl down together, and the open-air family slide is perfect for those who want a more relaxing ride. The true star of the water park show onboard is the duo of free falling slides, which drop guests out of a trap door at high speeds. Water Features: The water park area includes a swimming pool, jets, bubblers, geysers, tipping bucket, and wading pool. Nemo’s Reef has misters, sprayers, a tiny waterslide, and a water curtain. Details: Disney’s two newer ships are known for the AquaDuck, which first debuted aboard Fantasy’s sister ship Disney Dream. The clear, enclosed water coaster is the first of its kind at sea, with turns and G-forces similar to a landside roller coaster. Parts of the tubing even extend beyond the side of the ship, for unique (and slightly unnerving!) ocean views. Also onboard is Nemo’s Reef, a water play area for the littlest cruise guests. This is one of the only water areas on the ship where swim diapers are allowed. Details: The outstanding attraction in the Forest Aquaventure waterpark on MSC Seaside is the slideboard waterslide. Riders sit on “slideboard” rafts which have buttons that correspond to the flashing lights they’ll see as they whiz down the slide. The object of the waterslide game is the push the corresponding buttons and earn points. Riders will also hear music playing on the way down. At the end, there’s a leaderboard that keeps track of everyone’s points that day. For those that want to avoid the technology side of the water park, there are also two high-speed racing slides and a more relaxed inner tube slide. 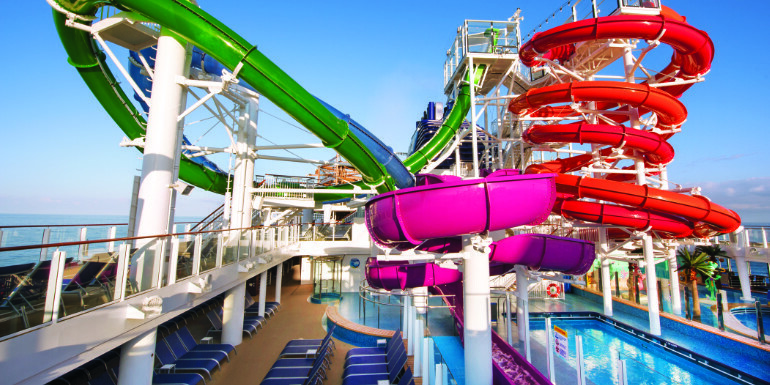 Details: Norwegian Epic boasts a slide that was the first of its kind at sea, The Epic Plunge. The tube slide splashes out into a swirling bowl, before depositing riders into a splashdown lane as a grand finale. 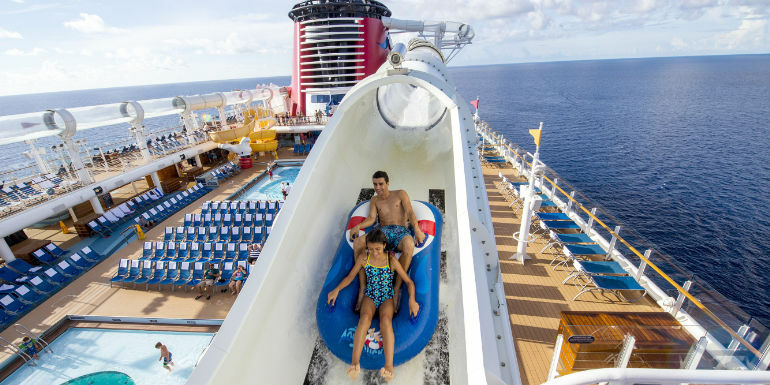 If this or the twisting tube slides sound like a bit much for little ones, the ship also includes a variety of other water features to cool off during a hot day. Water Features: Water cannons, jungle gym with water features, tipping bucket, and a wading pool with sprayers. In addition, there are two FlowRider surfing simulators and a sports pool. 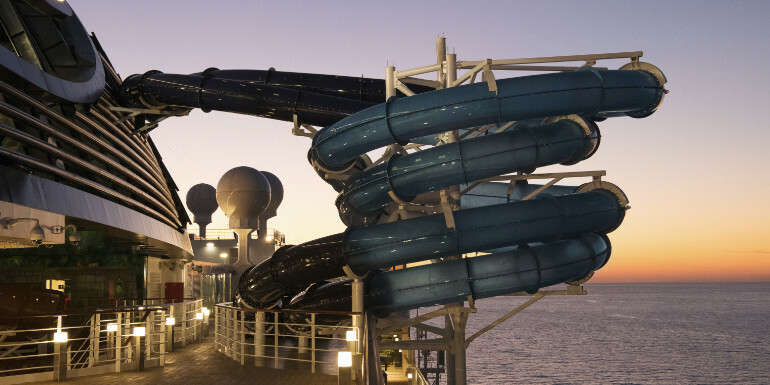 Details: You’ve already got a good idea of what the champagne bowl funnel slide is like on Harmony of the Seas, because it’s just like Norwegian Epic’s The Epic Plunge. 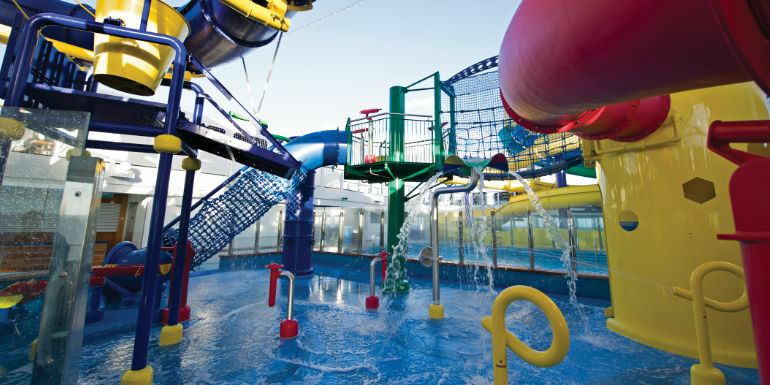 Two large racing waterslides, pint-sized waterslides in Splashaway Bay, and a variety of other water features complete the aqua park offerings onboard the ship. 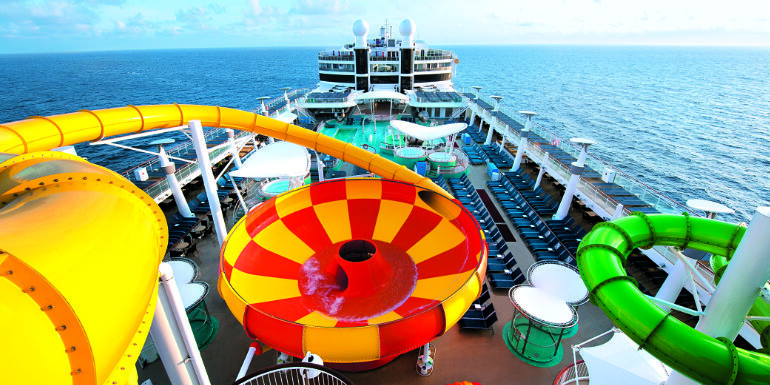 However, we would be remiss if we didn’t mention the Ultimate Abyss slide, which plunges ten decks at the ship’s aft. It doesn’t involve water, but we felt the need to mention this ginormous slide anyway. Details: Very similar to Norwegian Escape, Getaway has two side-by-side free falling drop slides. The Whip racing twister slides and a tamer family slide round out the water park’s biggest offerings. Younger kids will also love the pirate-themed water area complete with palm trees, fake cannons, and a swashbuckling ship. Water Features: Pelican Plunge includes a tipping bucket, and Spring-a-Leak offers misters, dripping pipes, and other water features that fit in with the broken plumbing theme. Details: Even though it’s not a ship, we couldn’t help but include Disney Cruise Line’s private island in the Bahamas, Castaway Cay. 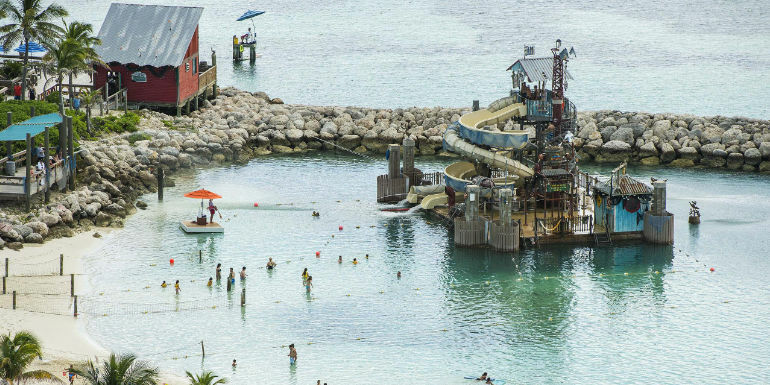 It’s full of fun activities both in the water and on land, including two water parks: the floating Pelican Plunge platform in the water, and the kids’ play area on the island, called Spring-a-Leak. Spring-a-Leak is themed to be the remnants of a washed away beach dwelling, and features a number of fun water features. 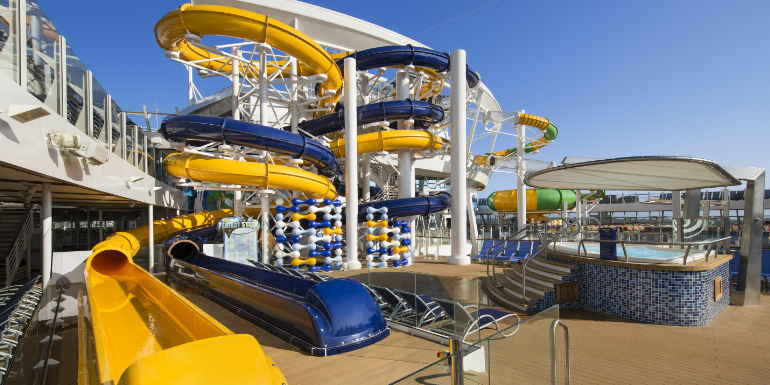 Which ships' water parks do you think look the best?